The region of Alesund and Sunmore is a land where the mountains and fjord meet the ocean. It is the land of your dreams – towering mountain peaks stretching high into the sky interspersed with sapphire blue waterways. Here is also the town of Alesund, rebuilt in an Art Nouveau style in 1904, the bird sanctuary island of Runde and lush, green valleys. This seven night itinerary combines three contrasting destinations: Alesund, Geiranger and Oye, and will immerse you in the region’s natural and historical highlights. On arrival at Alesund Vigra airport, self transfer to the Brosundet Hotel. On the banks of a canal in the centre of Alesund and surrounded by all of the town’s beauty, the Brosundet is a welcoming, recently refurbished property full of character. Many say that Alesund is the most beautiful town in Norway. See for yourself and let us know what you think. Overnight at the Brosundet Hotel in Alesund. Free time in Alesund. Within a short stroll of your hotel is the Jugendstilsenterest (Art Nouveau Museum), the Fisheries Museum as well as many of the colourful, preserved Art Nouveau buildings for which the town is renowned. Cafes and restaurants are in abudance, including a number of seafood establishments. Surrounding Alesund are the Sunnmore Alps. Take a walk in the countryside today and immerse yourself in the region’s natural beauty. One of our favourite hikes follows a marked trail to Sukkertoppen viewpoint (c.2 hours). From the summit there is a 360 degree panorama over Alesund and the fjord – breathtaking. Depart Alesund after breakfast and sail on board Hurtigruten to the Geirangerfjord, a UNESCO World Heritage Site. This leisurely journey will cruise along the s-shaped, 100km fjord passing small rural communities; picturesque, yet abandoned, mountain farms and flowing waterfalls – find a space on deck for the best views. 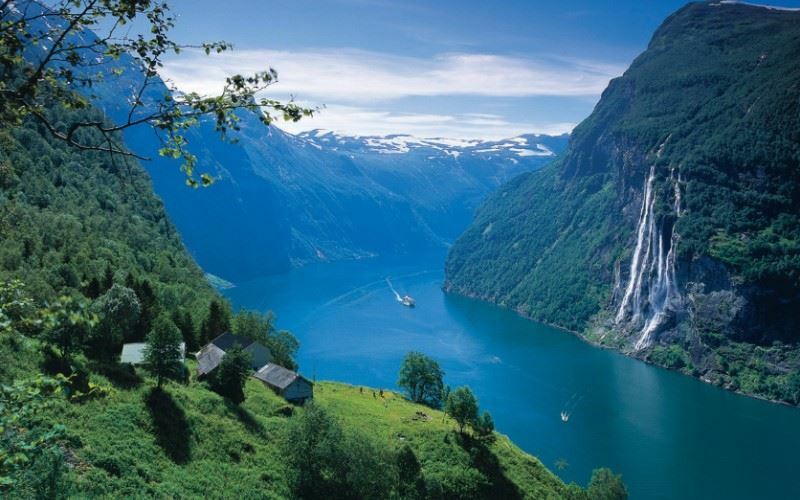 On arrival in Geiranger, you will be met and transferred the short distance to the Union Hotel. Overnight at the Union Hotel in Geiranger. Days at leisure on the Geirangerfjord. You could easily spend all of your time relaxing at the Union Hotel and absorbing the splendour of your surroundings, and you would not leave disappointed. The view from the hotel’s lounge, spa and outdoor Jacuzzi stretches for miles around. If you do decide to leave the hotel, you could join an excursion to the Dalsnibba viewpoint and the Skywalk platform, or a fjord cruise to a mountain farm returning to Geiranger on foot. Hiking trails are in abundance and kayaks can be rented locally. Gieranger has a fascinating fjord centre that warrants a visit. Overnight and evening meal at the Union Hotel in Geiranger. Today you will travel by local ferry from Geiranger to Hellesylt before taking the local bus through the Norangsdalen valley to Oye. Your journey will stop at Lyngstoylvatnet (lake) where you can view the sunken remains of a summer farm. At Oye is the Union Hotel, a charming, unique and historical property and your accommodation for the evening. The Union Hotel has been receiving quests since 1891 and a stay here, we are sure, will be one of the highlights of your trip. Overnight and evening meal at the Union Hotel in Oye. After breakfast, take the boat from Oye to Alesund and then self transfer to Alesund Vigra airport for your return flight to the UK. The Union Hotel in the village of Oye is a remarkable property that oozes character, charm and history. From the moment you step over the threshold you realise that this is a special hotel with immense potential to become one of the highlights of your Norwegian adventure. Since 1871 the Union has attracted guests in search of tranquillity and calm, both of which it provides in abundance. Its backdrop is of steep mountain peaks and lush countryside, and its environs encompass fast-flowing rivers and the Hjorundfjorden. Walkers, artists, writers and outdoor enthusiasts will be in their element. Inside the hotel has retained its original features and its adorned throughout with carefully selected antiques. It is like being transported to a bygone age. No guest room is the same and all have the power to impress. One of the most distinct hotels in Europe and highly recommended. 27 individually decorated rooms including standard and deluxe rooms.